Decided to hit lake Sonoma with my brother and do some night fishing. Because of the high temps during the day and the crazy pleasure boat traffic during the day. Plus you have a greater chance at catching a monster. We left the house around 830 and took our time heading to the lake. 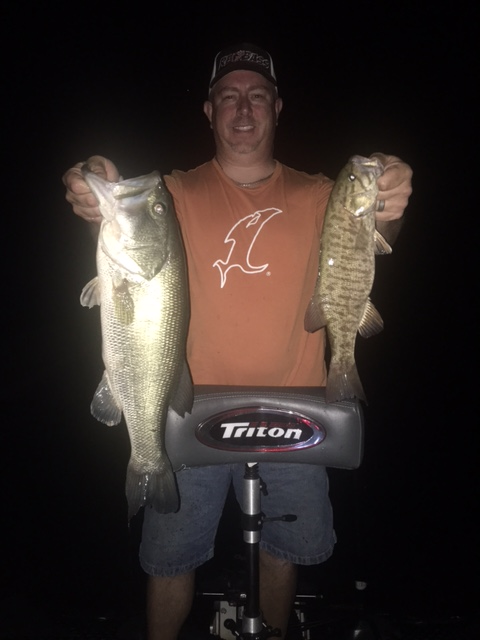 As i was waiting for my brother to get back from parking the truck, i was getting my rods ready for night fishing, i notice the water temp was around 83 and shining the light into the water i noticed there was about 4′ visibility. I grabbed a Dobyns 734 with a Johnny C’s California reservoir black and blue football jig with a Yamamoto flappin hog on the back and 50# Vicious no fade braid. 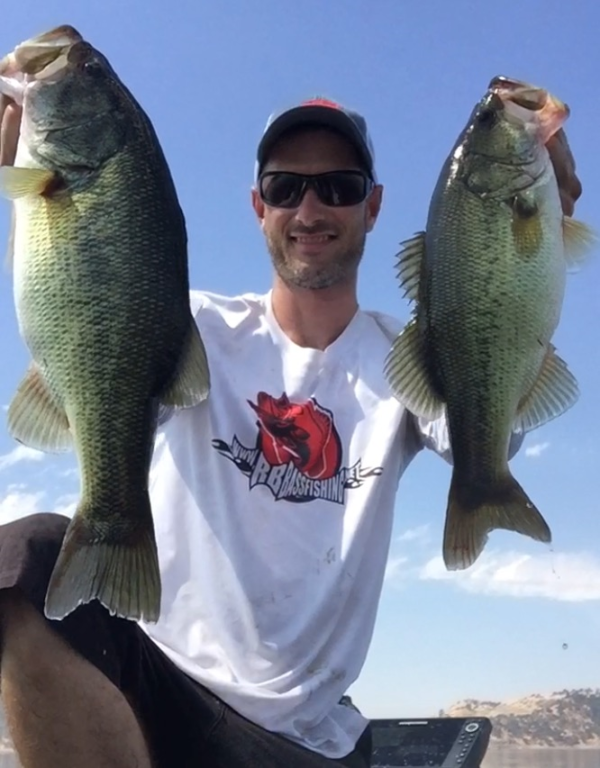 Then i pulled out a Dobyns 733 with a wacky rigged 5″ Yamamoto black and blue senko with 12# Vicious pro fluorocarbon and finally a Dobyns 804cb with a craw colored custom painted strike king pro model 3xd crankbait with 12# Vicious pro fluorocarbon. Not wanting to go far in the dark, i idled over to a sheer cliff with a flat next to it, going under the bridge just south of the dam. I picked up the crankbait and fired it out, cranked it twice and got slammed by a nice 2# smallmouth. Throwing it back i told my brother, “that was cool”. Making my second cast of the night i crank it down 4 or 5 times and get smacked again. Another 2# smallmouth. Threw that one back and fired out another cast turning to my brother as it landed and said “wow, might be a fun night” before he could say anything i hooked into another 1 1/2# smallmouth and i just smiled back him. I haven’t moved the boat at all and iv already hooked 3, nope make that 4 fish as i set the hook on another one l, but it came off half way to the boat. My brother was throwing a strike king midnight special spinner bait and wasn’t getting touched, so i gave him another one of my 3xd’s to tie on. On his second cast he stuck a nice 2 1/2# smallmouth. As he was taking the hooks out of his fish, i fire a cast up onto the flat and instantly get clobbered. This one feels a lot bigger, Taking drag and finally coming to the surface next to the boat is a nice 6 1/2# largemouth. We fished that 100 yard stretch and then idling across to the other side that had the same cliff and flat. Back and forth all night tell 4am, We stopped counting after 50 fish. All except 1 on the jig came on the Strike King 3xd craw colored crankbait.